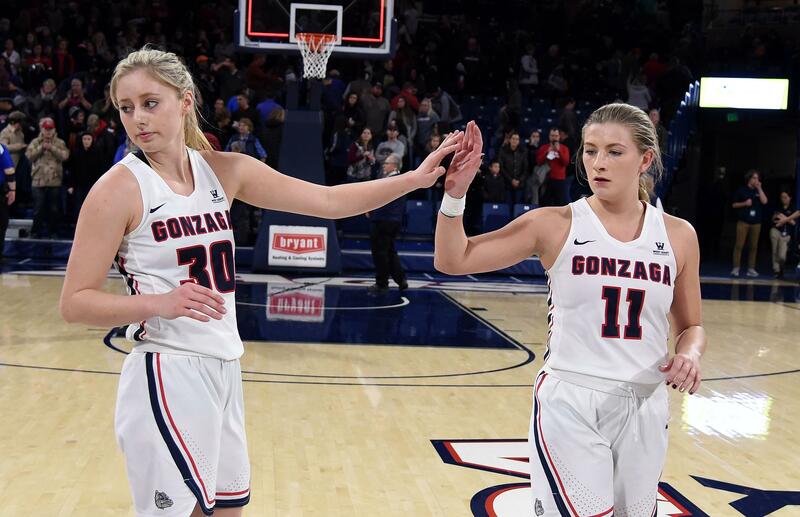 UPDATED: Thu., Jan. 31, 2019, 10:05 p.m.
STOCKTON, Calif. – Laura Stockton scored 15 points with seven rebounds and five assists and No. 15 Gonzaga pulled away from Pacific in the fourth quarter for a 63-51 women’s basketball win Thursday night. Zykera Rice added 13 points and seven rebounds for the Bulldogs (20-2, 9-1 West Coast Conference), who pulled into a tie with conference-leading BYU after the 25th-ranked Cougars lost at Loyola Marymount. Gonzaga won the first meeting with Pacific 88-65. There were seven ties and 11 lead changes before Rice hit a jumper in the paint, putting Gonzaga up 47-46 late in the third quarter. Stockton followed with a layup for a 49-46 lead entering the fourth. Chandler Smith hit a 3-pointer for the first points of the fourth quarter and Melody Kempton followed with two free throws and a layup to cap the 11-0 run. Gonzaga did not make another field goal, but Pacific was held to 1 of 11 shooting in the final 10 minutes and never threatened. Smith added eight points for the Zags. Kempton and Jenn Wirth scored seven points each. Valerie Higgins had 18 points and nine rebounds for the Tigers (12-7, 8-4), who have lost six straight in the series. Neither team shot above 37 percent. Gonzaga was 2 of 15 from 3-point range and Katie Campbell missed two, ending her streak at 19 games with a 3. The Zags had a 44-30 rebounding advantage with a season-high 23 on the offensive end for a 21-8 advantage in second-chance points. GU also dominated in the paint, outscoring Pacific 32-16. The Bulldogs travel to Moraga, California, on Saturday to take on Saint Mary’s at 6 p.m. Published: Jan. 31, 2019, 9:06 p.m. Updated: Jan. 31, 2019, 10:05 p.m.